Albany Architects: The Ogdens – Hoxsie! In the middle part of the 19th century, Albany took on a new look that was largely the work of father and son architects by the name of Ogden and their partners. Edward Ogden, born in England in 1826, came to Albany at the age of 13. He apprenticed as an architect with fellow Englishman William Woollett Jr. through 1849, and rose to partnership with Woollett from 1856 to 1870. Then he joined in partnership with another Englishman, Frank P. Wright from 1871 to 1889. Son Charles Ogden, an 1874 Albany Academy graduate, got his name on the firm in 1891, and when Edward died in 1900, it was Charles who carried on the business. The impact of the various iterations of the Ogden firms on Albany is nothing less than stunning, even though substantial works have been lost. Here are just a few of their works. 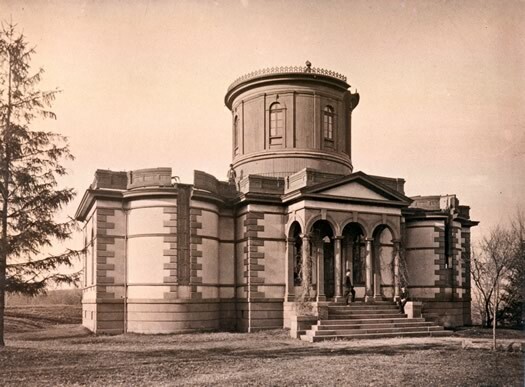 Among the lost landmarks of the William Woollett and Edward Ogden period: the original Dudley Observatory (1856), the Tweddle Building (1860), the original School 12 (1858). 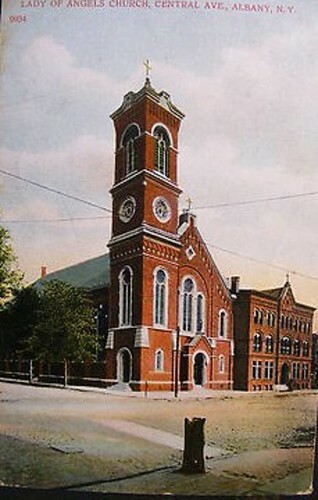 But still standing: the addition to the Church of the Holy Innocents (1866) at North Pearl and Colonie streets, Our Lady of Angels (1869) at Central Avenue and Robin Street, and the Emmanuel Baptist Church (1871) at 275 State St.
Later, the firm of Ogden and Wright made a tremendous impression. They built a number of schools: No. 15 at Franklin and Herkimer, 1871; No. 11, still standing at 409 Madison, 1873; the first Albany High School on Eagle Street, 1876; the New York State Normal School on Willett Street, 1885; and the Albany Business College, 1887, which still stands on the northeast corner of North Pearl and Columbia. They also built the Kenmore Hotel (1878) and the John Myers Block (1884) that collapsed in 1905. A number of their private homes survive, including the Marshall Tebbutt house (483 State St., 1887), the Bainbridge Burdick house (935 Madison Ave., 1890), the Eugene Hartt house (407 State St., 1890), and the William B. Elmendorf House (1001 Madison Ave., 1890). 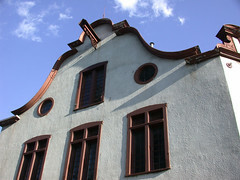 From 1891, the firm was known as Edward Ogden and Son, which continued to create a series of signature buildings. Unfortunately, their School No. 4 (Madison and Ontario, 1893), J.B. Lyon Block (Hudson Ave., 1893), St. Andrew’s Episcopal (Western and Main, 1897), the Albany Railroad Co. (Quail St., ca. 1898), the Drislane Store (144-170 S. Pearl, ca. 1898), and the Municipal Gas Building (112 State St., 1899) are all gone. But many are still standing: The James McKinney House (now St. Andrew’s Society, 150 Washington Ave., 1891), the YMCA extension (Steuben and Chapel, ca. 1894 — the front was built earlier by Fuller and Wheeler), the Convent of Our Lady of Angels (183 Central Ave., pre-1895), Madison Avenue Presbyterian (820 Madison, 1897), and the beloved Brides Row (144-170 Chestnut St., ca. 1900). From 1900 on, the firm was Charles Ogden. His first independent building was the American Cigar Co. factory (Arch and Grand, 1901), which still stands but isn’t much of a testament to architectural ability. He also built St. John’s Church (Green and Westerlo, ca. 1908), renovations to Keeler’s Restaurant at 56 State Street (now gone), the Hudson River Day Line Ticket Office (351 Broadway, with Walter Van Guysling), St. Anthony’s Church (Grand and Madison, 1908), Fuld & Hatch Knitting (Liberty and Hamilton, 1913). Perhaps his most recognizable works are the former Academy of Holy Names at 628 Madison Ave. (1914), right across from Washington Park and now part of Albany Medical Center, and the Albany Home Telephone Company (Howard and Lodge streets, 1903), which for many years housed a restaurant named after the building’s architect, Ogden’s. From 1916 on Charles Ogden was partnered with the Gander firm (Joseph, John and Conrad), with which he did alterations to Richardson’s Albany City Hall, including a new steel and fireproof roof. This late in his life it is difficult to tell what is Ogden and what is Gander, and his continuing contributions to Albany’s look is less clear. Charles retired in 1926 and died in 1931.